On Man From Mars, a lament about a loved one who's abandoned her, Joni Mitchell pines,"There is no center to my life now, no grace in my heart." At first, she had declined a request to pen a mournful tune for the Grace of My Heart soundtrack, insisting, "I'm not a hack. I have to feel what I write." 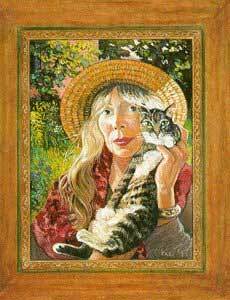 She reconsidered after her beloved tomcat Nietzsche (seen in Mitchell's self-portrait on the cover of Taming the Tiger) ran away from home. "The grief that I felt in his absence coincided with the grief of the character in the movie," she says. Nietzsche, by her account, is quite a character himself. "I call him Man From Mars because he's a little lavender lion who looks like an alien and walks on his hind legs as an expression of affection for me," she says of the yellow-eyed Abyssinian mix. "He's a real fraidy-cat and very devoted to me. He's romantic but you can't snuggle him. He'd give me these deep, long looks and chew on my hair while I rubbed his head. The absence of that ritual left a big hole." He vanished after a spat. Incensed by the cat's habit of piddling on floors, Mitchell finally cracked, scolding ,"If you're going to act like an animal, you're going to live like one!" Then she grabbed him by the stump of his tail and scruff of his neck, held him at arm's length and marched him outdoors. He was too offended to return, she says. Night after night, Mitchell called him from her yard and anxiously waited. The song's delicate sounds mimic what she heard: the rustling of leaves, bird songs, the drone from a distant freeway. This love story has a happy ending. Mitchell relates, "It took me 17 days to write this song, and the night I finished it, my amazing little mancat appeared in a neighbor's yard and I retrieved him. That was kind of mystical. "When I found him, he just yelled at me, almost hyperventilating by telling me off. So I yelled back in his language, you know, 'Meow-meow-meow!' When I changed to coaxing tones, he stopped yelling and went belly up."